My So-Called Soundtrack: Christmasongs: Merry Punksmas! “Merry Christmas (I Don’t Want To Fight Tonight)” – Ramones: You can’t talk about Christmas punk rock without starting here. Opening with Joey’s nasally snarl and immediately kicking into that iconic Ramones sound, “Merry Christmas (I Don’t Want to Fight Tonight)” is so awesome on so many levels. Johnny’s down-stroked guitar leads the holiday charge and Joey’s somewhat confident/somewhat pleading vocals ring out over Dee Dee’s bass and Marky’s drums. This song was released at the end of the 80’s and if VH1’s “Pop-Up Video” is to be believed, a young Liv Tyler appears in the music video for it. “Silent Night” – The Dickies: From late, great 1978, it's campy, pop-punk legends The Dickies with their super fun take on the old 19th century Christmas hymn. This is the band that also released singles about Gigantor and The Banana Splits, so you know what you're getting with a Dickies song. Goofy, fast, loud, big bassed '70s punk never goes out of style with me and thankfully I don't have to put that on hold during the Christmas season thanks to The Dickies! 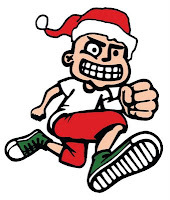 “Punk Rawk Christmas” - MxPx: In 2009, MxPx compiled all of their fan club Christmas singles and added a few new tracks to release the incredibly awesome Punk Rawk Christmas. The title track was a new recording and perfectly captures the desire to have a good Christmas in the midst of whatever issues, financial or otherwise, that may be going on. One of my favorite bands plus my favorite holiday equals an album that pumps even more yuletide awesomeness into the season. “Merry Christmas” – Face to Face: While I must admit that my favorite Face to Face song is probably their cover of "I'm Popeye, the Sailor Man" from 1995's Saturday Morning Cartoons' Greatest Hits, this one totally comes in at a very close second! "Merry Christmas" appears on Christmastime in the 909, the 2004 version of KROQ's yearly Christmas CDs from Kevin & Bean. Face to Face actually released an early Christmas song - their swinging' lounge-take cover of "Blue Christmas" from 1996's O Come All Ye Faithful - but "Merry Christmas" is quintessential '90s skate punk gold. “It’s Always Christmas At My House” – Huntingtons: It’s no secret that the Huntingtons are deeply in love with, and are masters at paying homage to, the Ramones. They were even lucky enough to be Joey Ramone’s backing band for a couple of shows at CBGB’s before he passed away. They wrote “It’s Always Christmas At My House” for Tooth and Nail Records’ first Happy Christmas compilation and it’s definitely a crowd pleaser. The lyrics playfully reference National Lampoon’s Christmas Vacation and describe that crazy Christmas over-the-topness in all of us. Okay, most of us…some of us…just a few of us? Well, at least we have an anthem! “Christmas Eve (She Got Up And Left Me)” – Rancid: After wearing out my copy of …And Out Come The Wolves my sophomore year of high school, I’ve always had a soft spot for Rancid. Their unique mixture of punk, reggae and ska has always stood out to me and they always get me moving. The Christmas part of this song pretty much boils down to just being the date the girl left, but I still count it as a Christmas song. “Christmas on Mars” – Groovie Ghoulies: Is this the best Christmas 7" vinyl single of 1992? Probably so. I mean, sure, Bon Jovi released "I Wish Everyday Could Be Like Christmas" on the flip side of their "Keep the Faith" single that same year, but "Christmas on Mars" is at least the best A-side, right? I really love listening to this one on dark morning commutes to work during the Christmas season to pump me up for both the day ahead and also the season in general. At least than 2 and a half minutes, this one doesn't run the risk of overstaying it's holiday welcome. Plus, there's not enough "Christmas in space" songs out there You just can't lose with this one! “This Time Of Year” – The Mighty Mighty Bosstones: Great punk rock usually carries a message right? With “This Time Of Year,” The Mighty Mighty Bosstones remind us that all the “stuff” associated with Christmas is nice, but the real meaningful things are spending time with friends and family and letting all the peace and goodwill towards men come out in your attitude. I love, love, love this song and the bouncy rhythm and lyrical focus always put a huge smile on my face. “Oi To The World” - No Doubt: I included The Vandals’ original version of “Oi To The World” in my personal favorites post and I really like No Doubt’s cover too. Gwen does a good job handling such a rowdy vocal and I love the dancehall “Frosty The Snowman” breakdown in the middle as well. Besides adding that and a few horns, they keep it pretty much the same. Why mess with a good thing right? “Santa Claus Is Thumbing To Town” – Relient K: I first heard this song on Tooth and Nail Records’ Happy Christmas Volume 3, but it can also be found on Relient K’s two Christmas releases, Deck The Halls, Bruise Your Hand and Let It Snow Baby…Let It Reindeer. I love the humor and chaos in the lyrics and the image of Santa trying to hitchhike after his sleigh breaks down is great. Funny, boisterous and still so festive, it should be on as many Christmas albums as it can.